Mullaghmore mountain is rich in heritage and natural beauty. It is famous for its flora, wildlife and it’s incredibly beauty. Geological evolution over millions of years has arranged this landscape in such a way that today it is now an area of outstanding natural beauty and it is recognised as one of the most distinctive landscapes in Europe. Mullaghmore is a mountain that accommodates the greater part of the Burren National Park framed by the Slieve Rua hills to the east and Clifden Hill to the west. The rocks of Mullaghmore consist of carboniferous limestone, a sedimentary rock that was laid down under the sea 350 million years ago. The limestone varies in texture and contains fossils and ancient remains of plants and animals, which are compressed together. Fossils embedded in the rocks are still evident today. 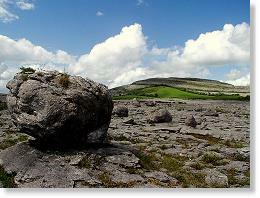 Even though Mullaghmore in the South Eastern Burren is similar in composition to the surrounding landscape, there are many contrasting characteristics. One of the most striking features when looking at this mountain is its unique shape. Located within this paradise - in addition to the superb scenery and great walks - is a wide array of wildlife flora and fauna. Venture into a land of wilderness and beauty and experience the timelessness and beauty of a hidden landscape.